McEwans Champion Ale is a popular Ale available from Tesco Groceries in 50cl to buy online. Visit Tesco Groceries for the best price for 50cl of McEwans Champion Ale or compare prices on our other Ale products. A magnificent thick dark-brown ale that has won many awards for its taste and certainly lives up to its name 'Champion Number One'. With a slightly higher abv (at 7.3%) it is slightly deceiving and has a distinct sweet nose. A great warming brew the beer is fantastic on a cold winters night. Enjoy with hearty meals. 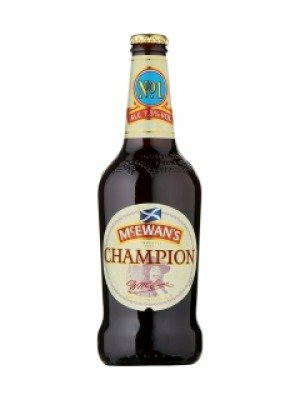 Where to buy McEwans Champion Ale ? McEwans Champion Ale Supermarkets & Stockists. You can buy McEwans Champion Ale online in most retailers and find it in the Ale aisle in supermarkets but we found the best deals online for McEwans Champion Ale in Tesco Groceries, DrinkSupermarket.com, and others. Compare the current price of McEwans Champion Ale in 50cl size in the table of offers below. Simply click on the button to order McEwans Champion Ale online now.